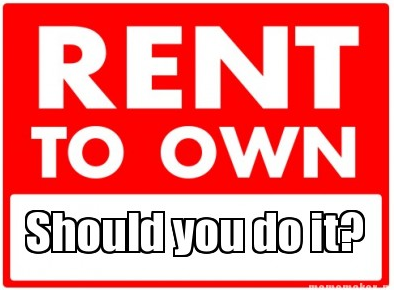 If you’ve driven around the Metro Detroit area lately, there is a good chance that you’ve seen a roadside “Rent to Own” sign for real estate. This is another name for a “Lease to Own” agreement. Before you seriously consider this type of arrangement to sell or acquire real estate, you should be aware of how this type of agreement works. Typically, a would-be buyer enters into a written lease agreement with the owner to rent the property for a specified length of time. At the same time, the parties enter into a separate agreement for the buyer to purchase the home at a specified price and by a certain date. This is the purchase option. The buyer may exercise the option to purchase the property at any point during the rental period up until the option expires. The option period can be for any length of time agreed upon by the Parties, ranging from several months to several years. Depending on what terms the parties have agreed upon, the owner may require a monthly payment that exceeds the going market rental rate and may also require a lump sum option payment at the time the agreement is signed. If the buyer exercises the option to purchase the property, the seller credits that portion of the monthly rental payment that was above the market rate and the option payment toward the down payment and closing costs. If the buyer does not purchase the property, all of the rent that was paid and the option payment remain with the seller. Until the option to purchase is exercised, the parties are in a typical landlord-tenant relationship and the rights of the parties are controlled by the parties’ agreement and landlord-tenant law. For example, if the buyer defaults under the lease, the owner may issue an appropriate notice and seek to regain possession of the property by filing an action for possession in the district court. Not only can the owner get a money judgment and a judgment of possession to evict the tenant, the owner can keep the option payment that was made and all of the monthly rental payments received. If an owner is having trouble selling the home, renting to own provides an alternative to lowering the home’s price, taking the home off the market, or renting the home out long term. Because a selling price is established in the option to purchase agreement, the current owner knows what to expect if a sale goes through. If the market declines during the lease period, the sale price is already locked in. If the buyers are unable to qualify for a conventional mortgage, a lease to purchase option allows them to build up their credit so they can then qualify for a mortgage. And by signing a contract now, the buyer locks in a purchase price if the market is rising. The buyer also does not have to worry about having to pay property taxes, homeowner’s insurance or maintain and repair the home as those expenses will remain with the current owner. If you are thinking about selling your property using a rent to own or lease option agreement, I am available to discuss your specific situation and to help determine the best available option. Careful drafting of the documents to be used can avoid unnecessary problems down the road.